One might ask, why visit the Grand Duchy of Luxembourg? And second, what is a grand duchy? To answer the latter question, a grand duchy is a grand dukedom, a territory whose head of state is a monarch, either a grand duke or grand duchess. Luxembourg is unique in that it is the only remaining grand duchy in Europe. It has been one since 1354! Now I’ll try to answer the first question. 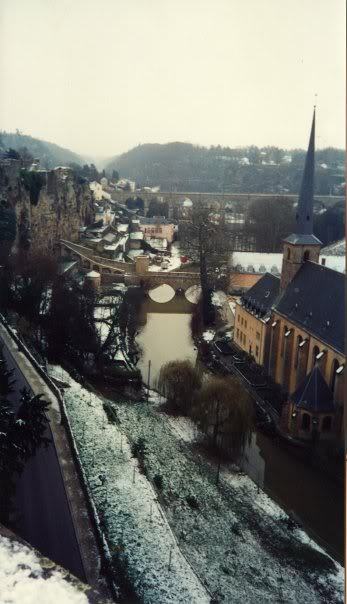 My fascination with Luxembourg started in the sixth grade. We had a renaissance fair at my school and we all had to study a European country as it would have been in the Middle Ages. We had to prepare a 30-page paper — that’s right, in elementary school — that reported all about the country. Then we had to dress like one of it’s citizens during the period and prepare a booth with information and food from the country. I wasn’t one to choose an easy country like France or Italy — I was intrigued by one of the continent’s smallest countries. That’s how I first learned about Luxembourg. I even wrote the Luxembourg Embassy in Washington, D.C. for information about their nation. The ambassador’s staff was nice enough to send me loads of information. I was hooked on Luxembourg and learned all about it! I even bought one of their flags. Fast forward to this morning when I woke up in Luxembourg City. After visiting the WC down the hallway, I then packed my gear before going downstairs to have my breakfast. I heard the man that served me speaking Spanish to an employee, so when I checked out, I did so in Spanish. It’s good to be bilingual but I certainly do not speak French, Dutch or Luxembourgish. I left around 9 a.m. to tour the casements, old castle mount, palace and WWII monuments. During the Middle Ages, the House of Luxembourg its territory and power through strong fortresses. At a strategic position in Europe, the formidable fortress was referred to as “Gibraltar of the North.” Between 1443 and 1815, Burgundian, Spanish, French and Austrian each fought for the fortress and the surrounding countryside. From the 14th century to the first half of the 15th century, four Holy Roman Emperors and four Kings of Bohemia came out of the House of Luxembourg. The fortress mount testifies to a long line of history. After Napoleon’s defeat, the Congress of Vienna in 1815 re-drew Europe’s map. Because of the fortress’ importance, they decided to create a new country around the fortified castle: the Grand Duchy of Luxembourg. It was certainly beautiful covered in snow. Most people here speak Luxembourgish to one another on the streets and in homes, but French and Flemish are common here as well. Most people here that I have spoken briefly with don’t speak English too well because they speak French instead. The city is very beautiful with the snow falling and blanketing the mount and city rooftops. Luxembourg City has a peculiar mix of historical remains combined with a modern financial district know worldwide for its financial firms. There are banks and investment houses everywhere, thanks largely to a favorable business climate of low taxes. The whole nation only has a population of 400,000, about the population of Birmingham (Alabama) and a few suburbs, with a large number of them living in the capital. I found Luxembourg to be a really clean and interesting city. On my way to the train station, I saw a 60-year-old man (I am guessing) fall as he tried to regain his balance on an icy street. The poor chap fell face first on the cobblestone street. Two other men and I rushed to help him. He wasn’t moving at first when we picked him up, and we noticed he looked to be in shock upon becoming conscious. His eyes were sunken in his white wrinkled face while blood streamed from a gash at the top of his nose along with cuts on his lips and hands. After we held him up, I hastily went to a nearby shop where I notified the proprietor of the emergency. We assisted the man to her shop where she called a medic. I did all that I could do until the ambulance came to take him to the hospital, so I was hoping he would be okay. Then I continued on to the train station. Unfortunately, I had a brief moment of panic as I had problems getting my luggage out of the locker that I had deposited it in a couple of hours earlier. I received help from a worker there and it turned out I had done it wrong (oh well)! Next stop is Brussels to visit Belgium for a couple of days. The scenery was stunning in the hilly Ardennes mountains of northern Luxembourg and southern Belgium, with a soft coating of snow hanging from the trees and blanketing houses along the way. I couldn’t help but think of all the soldiers, many Americans, who died here over 80 years ago in the forgotten war, WWI. In fact, more American “doughboy” soldiers – many younger than me – died here in battles than any other location during WWI. The savageness of that war was now covered by beautiful fields and rolling hills. I arrived in Bruxelles around 13:20 p.m., I checked into a hotel that I booked ahead of time. I then made my way to the Grand Place, or Central Square, to try some pommes frites med mayonnaise. These fries were to die for and were triple fried from fresh cut potatoes. I also samples some Brussels waffles, which put American “Belgian” waffles to shame. It was beautiful taking in the views of the historic square and its surrounding guildhalls while eating fantastic food. I then visited the Hotel de Ville (Town Hall) and and the (Broodhuis) Breadhouse, which is the Museum of the City of Brussels. The Hotel de Ville looked stunning too when I visited the Grand Place later that night. Also, I visited the Cathedrale St-Michel et Ste-Gudule, which has some of the most colorful and ornate stained glass in the world. There is so much history surrounding these cobbled streets. Later in the afternoon, I visited the Parlamentarium (European Parliament) to learn a little bit about how European government works. I capped the day with a visit outside the center of the city is the Atomium, one of the city’s icons from the 1958 World Fair. The landmark is shaped in the form of an atom and the views from the top were extraordinary. After dinner in a pub near the Grand Place and a great Belgian brew — a blonde Duvel — I went back to my room and read up on my upcoming ravels to Antwerp, Ghent and Brugge during the next couple of days.